The triangular Marcanti peninsula was an offshoot of the industrial/commercial strip in Amsterdam-West, where it was used for storage and circuses. 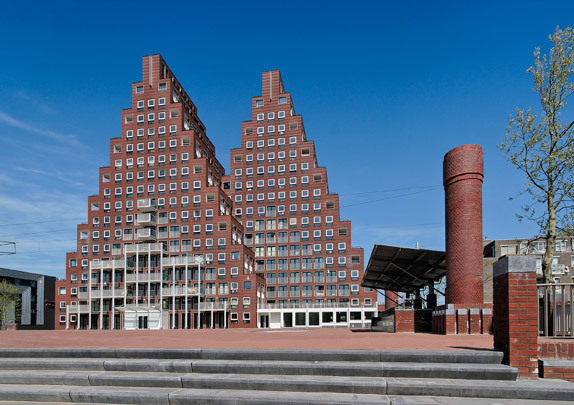 In the early 1980s it was developed to an urban plan by Sier van Rhijn with 300 low-rise dwellings. Two decades later the area has been completed with a striking housing block, a school and a public square atop an underground parking facility. The pyramidal forms of the 55-metre-tall block are inspired by the shape of the peninsula. The building acts as a noise buffer to the bustling Jan van Galenstraat. Its facades sport a variety of brick types and bonds.